Surprise, surprise, I have one final guest post to share with you today :-)! Dorra from Didoline's Nails ran a wee bit late but her nails are so gorgeous I still wanted her around on my little blog. Really, she is such an amazing blogger and I'm honored she made time to create this post! So be sure to check out her site, in the mean time lets take a look at what she prepared :-). My name is Dorra aka didoline from Didoline’s Nails :) Today I’m happy to be here as a guest ! I’ve been following Deborah for quite a while now, and we all know how amazing her swatches are. Today I’m here to show you one of my lastest purchase which is Marvellous Magenta by LilypadLacquer. 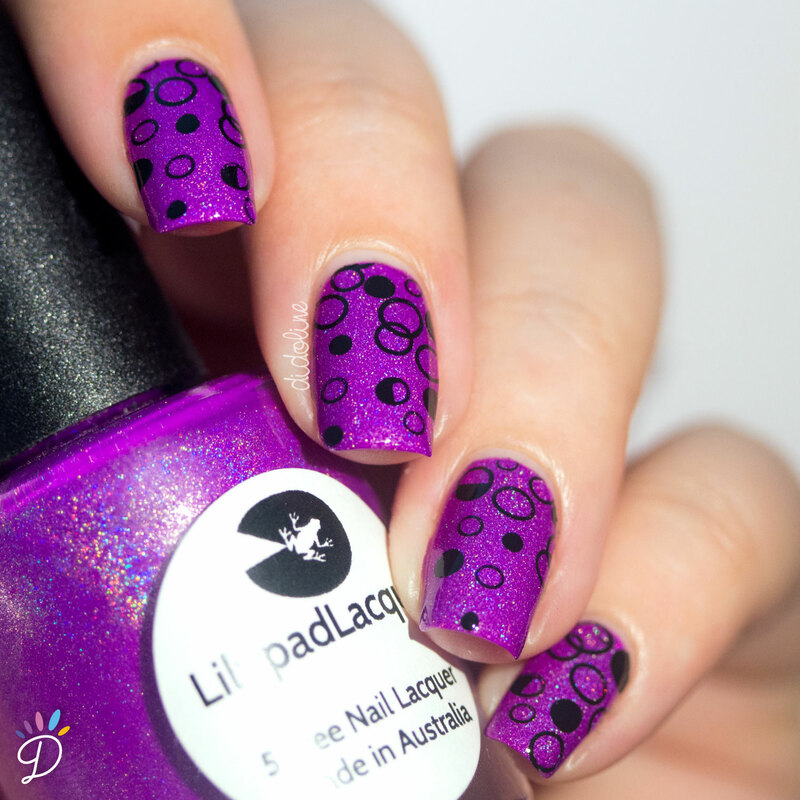 I’m a huge fan of LilypadLacquer’s nail polishes, I think they truly are amazing. And Marvellous Magenta makes no exception. 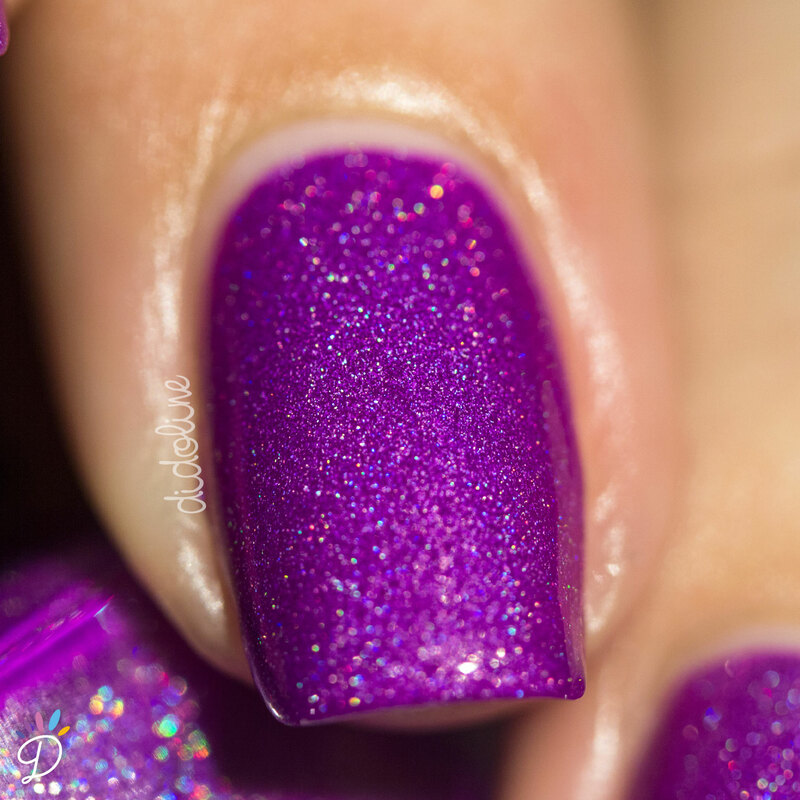 This shade is opaque in two coats and you can definitely see the holo in it. Even if I’m overwhelmed because of my work, I like my nails to be different on a daily basis. Which is why I couldn’t let this shade on its own on my nails two days in a row so I decided to go with a little stamping. I found my design on a Pueen stamping plate n°36. This plate is part of the Love Elements stamping set. For the stamping itself, I used the Pueen stamper and my Konad black. I really love how a stamping looks over a holo base, the holo gives some kind of dimension to the nails! I finished with my favorite top coat, the Sèche Vite :) I love stamping because it makes nail-arting your nails so easy! Thank you all so much for reading my guest post, and thanks again to Deborah who let me take her place for one day :D Feel free to check my Facebook or my instagram if you wanna see more of my manis! Thanks so much for this gorgeous look Dorra! I absolutely love the basecolor you used and well, you can never go wrong with stamping in my book ;-).